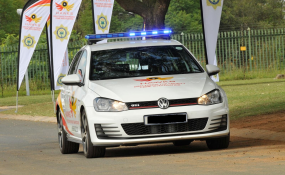 Golf GTI used by the Hawks division of the South African Police Service. The Hawks have arrested a second suspect believed to be part of a racket stealing vehicles from South Africa and smuggling them to other countries via Zimbabwe. It is understood that most of the stolen cars find their way to Malawi, Mozambique and Tanzania. Hawks spokesperson for Limpopo province Captain Matimba Maluleke said Raymond Sibusiso Tshabalala was arrested on January 9 at the Brixton Regional Court in Johannesburg while attending court on an unrelated charge. He said Tshabalala was granted R3 000 bail at the Musina Magistrates' Court on Friday and was immediately re-arrested after paying bail on another charge of burglary he committed in Free State Province recently. "The suspect is believed to be one of the ringleaders of a group of thieves that stole six new Ford Ranger cars at Phalaborwa Car Dealership in Phalaborwa in December 2017," said Capt Maluleke. "Five of the six stolen vehicles were recovered at Limpopo River near Beitbridge before they could be smuggled into Zimbabwe on 9 December 2017." Four suspects are Frank Dube (32), Tsununu Ahmad Maphosa (32), Ndokiseni Mbedzi (45) and Mpho Dzwuguda (27) who have since been arrested and appeared at Musina Magistrate's Court. Dzwuguda and Mbedzi were granted R3 000 bail each. Tshabalala is facing charges relating to burglary at business premises and theft of motor vehicles. Capt Maluleke said the Hawks had come up with a raft of measures to minimise vehicle thefts and their smuggling to other countries. The smuggling of stolen cars via Zimbabwe from South Africa is rife with authorities from both countries having recovered over 40 vehicles along their boundary. In 2012 Zimbabwean police smashed a well-orchestrated car smuggling syndicate near the Panda Mine area and arrested seven Malawians and recovered five top of the range vehicles. The vehicles include two Toyota Fortuners, one Nissan Navarra, Toyota Hi-Rider and a Toyota Vigo all worth R4 million. It is reported that some of these syndicates are linked to security personnel manning the border and officials, the Zimbabwe Revenue Authority (ZIMRA) and the Central Vehicle Registry (CVR). The officials are alleged to be facilitating the smuggling and registration processes.